Tile sealing is the application of a sealer, which is designed to protect tiles from any damage. 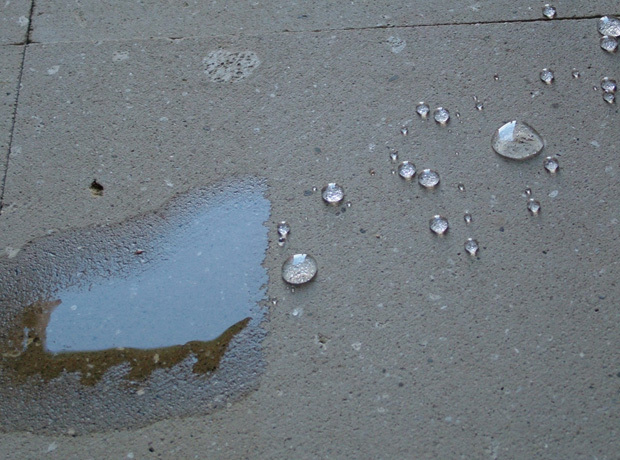 Sealers are usually specific to the surface type or the location, and may provide stain protection, water-repellent properties, or a combination of both. For help and advice on whether your surface could benefit from tile sealing, call us on 0800 754 783 or fill in the contact form at the bottom of the page. The left hand side of this surface is natural; the right hand side has had a water-repellent sealer applied. While generally ceramic and porcelain tiles do not require a sealer application there are exceptions, which absolutely can gain a benefit from the application of a sealer. While glazed ceramics do not need a sealer, unglazed ceramics (also known as encaustic tiles) are extremely absorbent, and can mark and stain very easily. These surfaces should have a penetrating sealer or surface coating applied to protect them and make them easier to keep clean. Porcelain tiles when made with top quality clay and well processed generally do not need a sealer. As the market has grown and moved away from traditional manufacture powerhouses the price has dropped because manufacturers are using cheaper quality clay and reducing quality control methods. This has led to a range of porcelain tiles that can take a penetrating sealer which can help to reduce staining and make the tile easier to keep clean. Polished porcelain is an interesting exception to the rule of sealing tiles. While the tile itself might be of best quality clay and inherently non-absorbent, to create the polished finish the tile is ground smooth. This grinding process actually opens up a fine pore on the surface of the tile. While technically still non absorbent, the small opening can allow moisture in and stain. Traditional sealers cannot get into these small openings but there are a range of sealers specifically designed to get into these pores and plug them, which stops the staining process and makes the tiles easier to clean. Finely textured porcelain tiles, while non-absorbent can mark and discolour easily as dirt and grime gets into the fine texture, which can sometimes be very difficult to remove. There is a sealer specifically designed for this problem. It does not soak into the tile (as it is not absorbent) but chemically fuses into the tile’s surface. This process does not alter slip but changes the surface tension to reduce marking, and makes the tile easier to remove future contamination.